One of the star attractions at Bauma will be the launch of the new Bobcat E10e Electric Mini-Excavator, the industry's first commercially available fully electric, zero tail swing (ZTS) mini-excavator in the one tonne class. 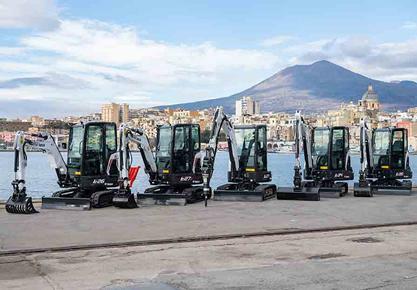 The E10e will be presented both in the demonstration area on the stand, but also in its own dedicated zone, one of six on the stand that demonstrate applications for Bobcat products. With its ZTS profile, no emissions, a low noise operation and a width of just 72 cm, the new E10e can easily pass through standard doors and in and out of lifts, making it ideal for indoor applications such as demolition and basement construction. In addition, by coupling the E10e to an optional external Bobcat super-charger while operators are on normal work breaks, the E10e can operate for a full 8 hour working day.